Spring vacation post part two has finally arrived! Yes, it’s the middle of July, but better late than never, right? 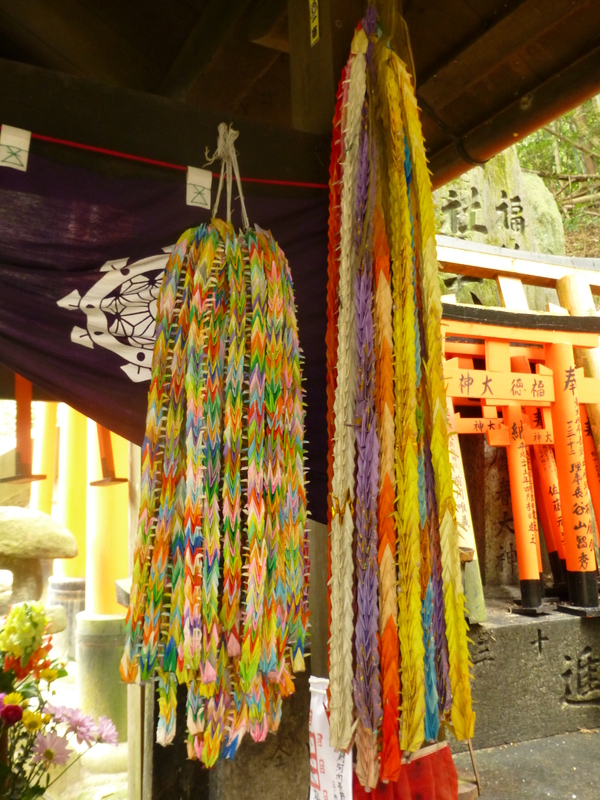 In this post I’ll talk a little about the temples and shrines we visited in Kyoto. With the exception of one sort of tucked away temple, most of our visits were to some of Kyoto’s more popular destinations, so you might recognize them! First up is Kiyomizu-dera (translation: temple of clear water), a Buddhist temple that was first established in the 8th century. 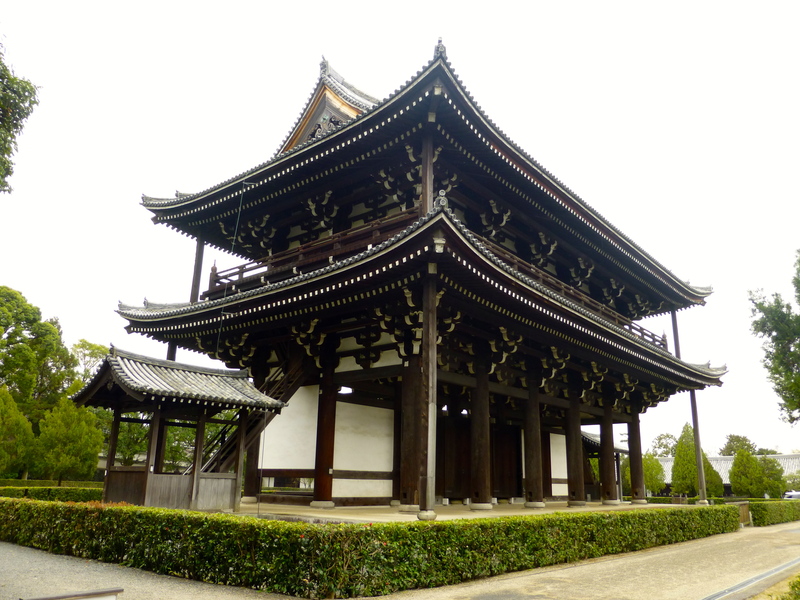 The temple was burned down several times, and the current building was constructed in 1633. 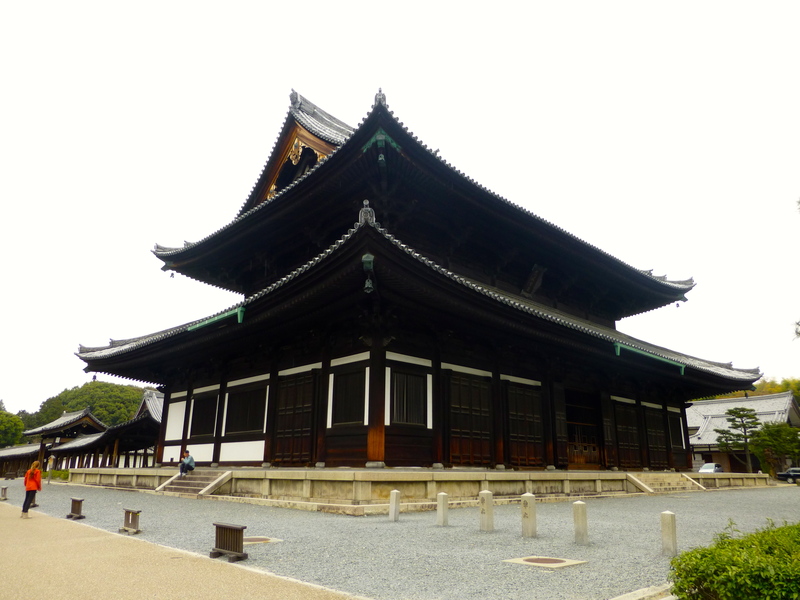 It is one of 17 UNESCO World Heritage Sites in Kyoto, and I’d say that every person living in the Kansai area is likely to visit this temple at least once. Leading up to the temple is Ninen-zaka, a sloped street filled with little restaurants and shops selling the most Japanese of things. 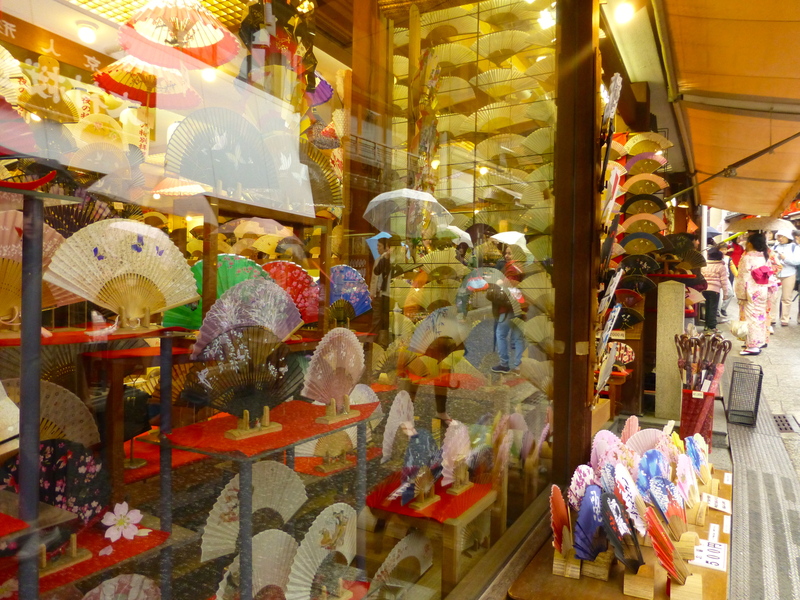 Some of the most common items are folding fans, kimonos, kimono accessories (hair clips, shoes, etc. ), and Japanese sweets like mochi and manju. 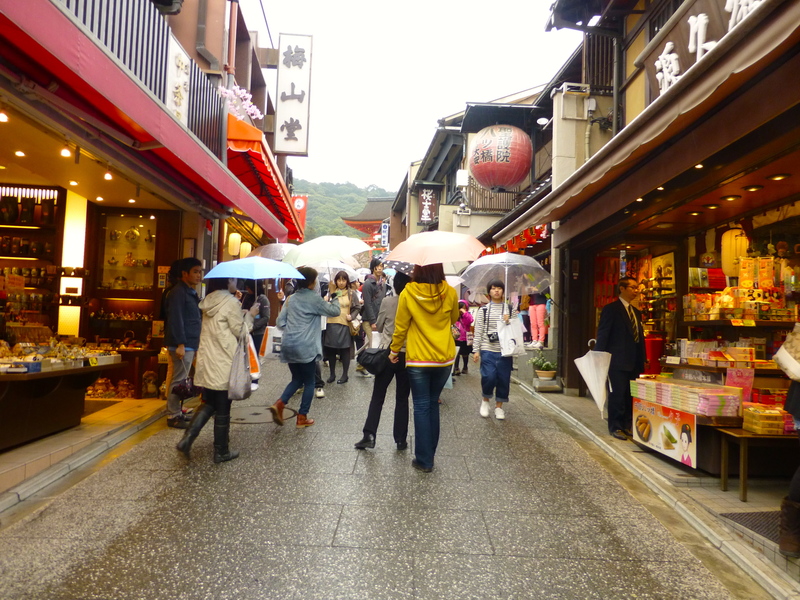 It was a bit rainy on the day we visited, but the narrow street was still lively and packed with people. 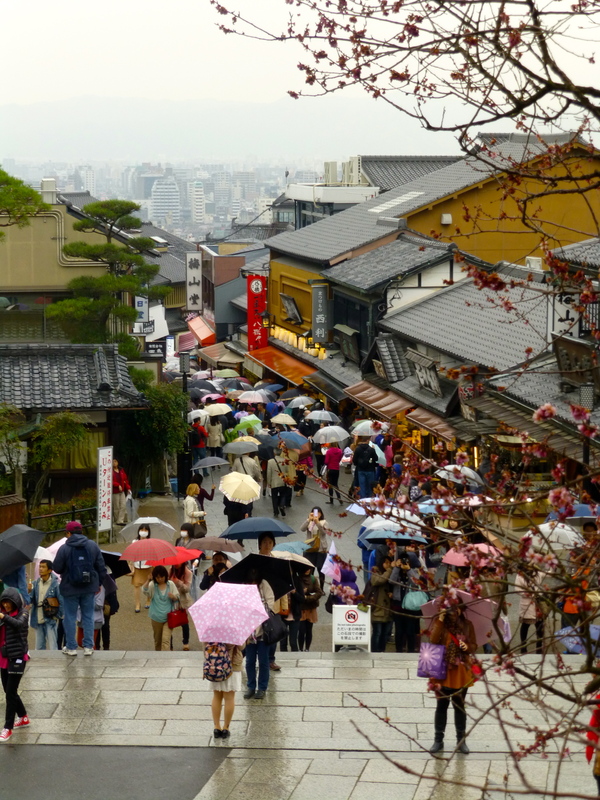 Looking back down at Ninen-zaka from the steps at the edge of the temple complex. 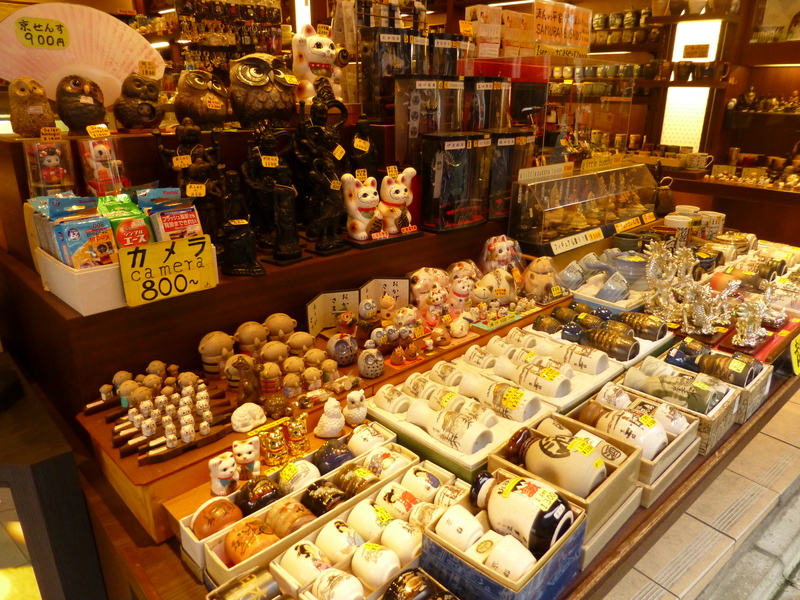 A souvenir shop on Ninen-zaka. The white cats with the raised paw are called “maneki-neko” and they’re supposed to bring wealth, happiness, and good luck to their owners. 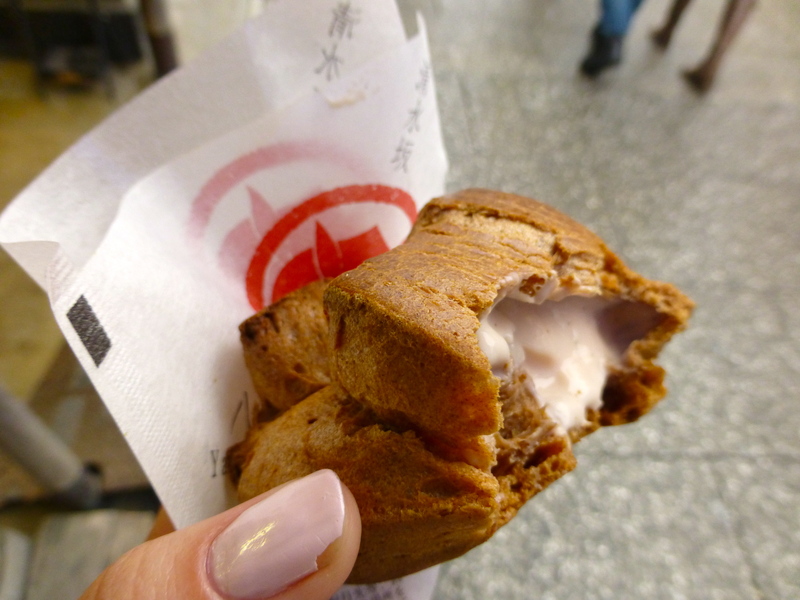 This is the Japanese version of a cream puff (called “shu cream” here) that I bought from one of the sweets shops on Ninen-zaka. They usually use custard cream, and the reason the cream in this one is pinkish is because it’s this strange “sakura (cherry blossom)” flavor that is popular in the spring in Japan. And no, it doesn’t taste like cherries or anything. It pretty much just tastes like flowers. It’s actually pretty good. Then after you’ve spent more money than you intended to at souvenir shops and sweets shops (mostly the latter if you’re me) and you reach the top of the hill, the street opens up and you find yourself at the bottom of some steps. 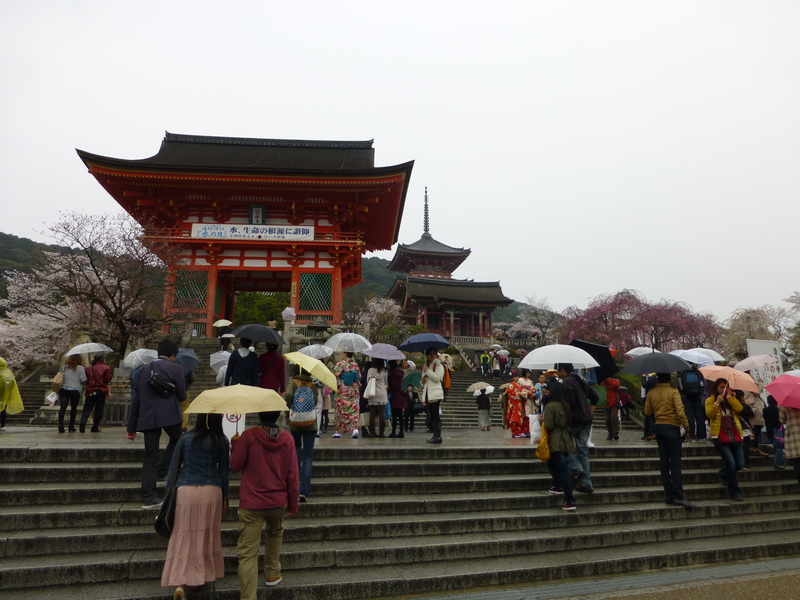 There is a large red gate, a pagoda, and a few other structures on the steps leading to the temple, along with tons of cherry blossom trees. The steps leading up to the temple and some other buildings on the temple grounds. 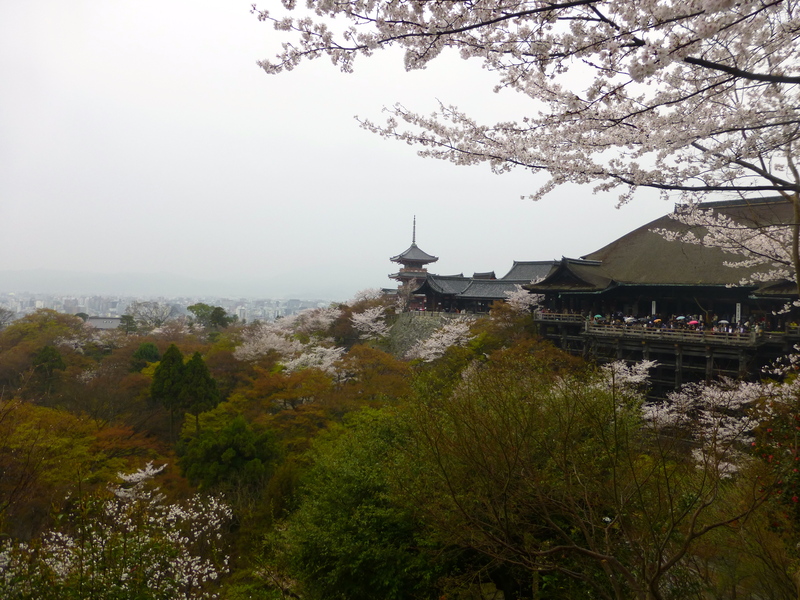 The funny thing about visiting Kiyomizu-dera is that you don’t really get a good view of it (or at least that really iconic view that you seen in travel magazines) until you’ve walked through it and turn around to look back at it. Here’s a view of the temple grounds from inside the temple. The people lined up on the left side are getting their money shots of the temple from there. 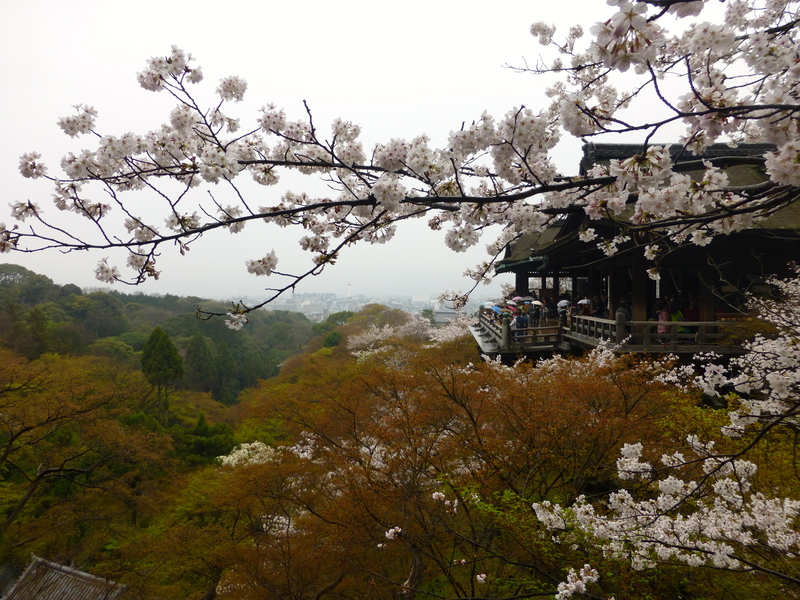 Here are my two attempts at a magazine quality Kiyomizu-dera photos. Unfortunately I think I automatically fail because of the crappy weather, but hey, I tried anyway. Tried to frame it up with the cherry blossom branches. Let’s face it, I’m not a photographer. Tried to get the pagoda in this one too. Interesting fact: the structure that supports the main hall of Kiyomizu-dera was built using only wood and without the use of a single nail. 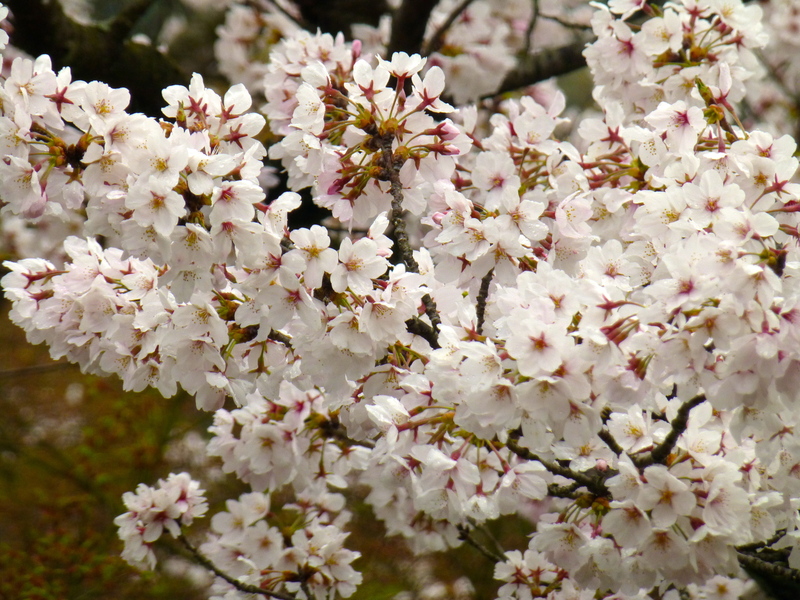 Cherry blossoms from the trees on the temple grounds. I have like two hundred pictures of them so I figured I’d throw at least one in here. 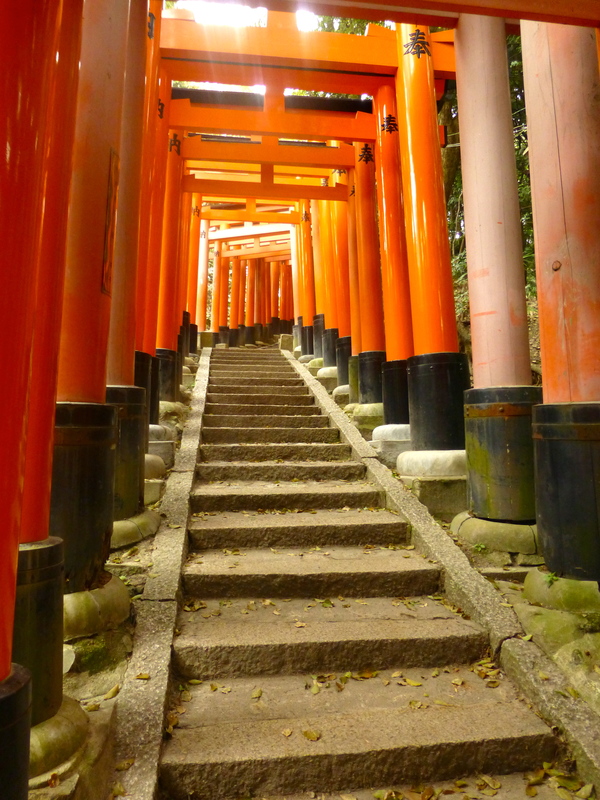 Another really well known place we visited in Kyoto is the Fushimi Inari shrine, which has over 1,000 Torii gates on several connecting paths up Mount Inari. 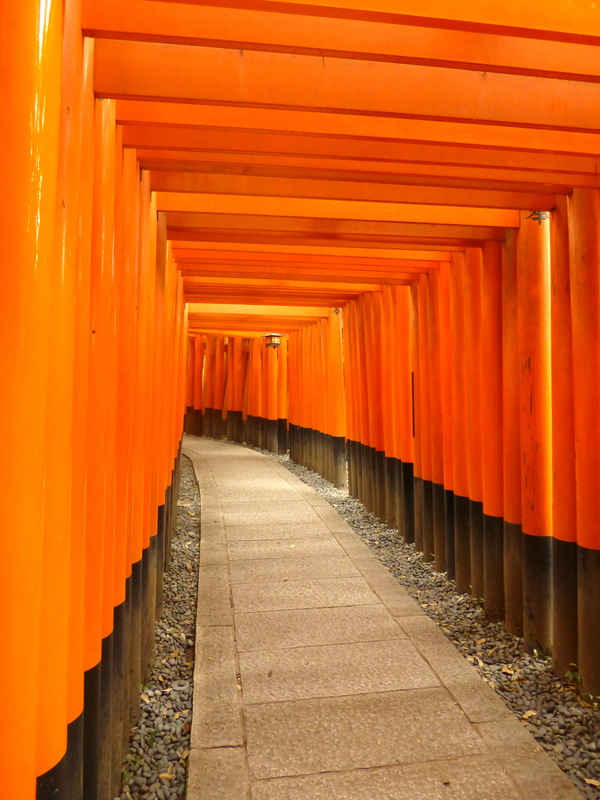 These orange gates are sort of a staple of Japanese Shinto shrines, and we have 39 at the shrine in Izushi too. Here’s one of my favorite paths. For those who have seen the movie Memoirs of a Geisha, the scene where the girl is running through the gates to the shrine were filmed here. 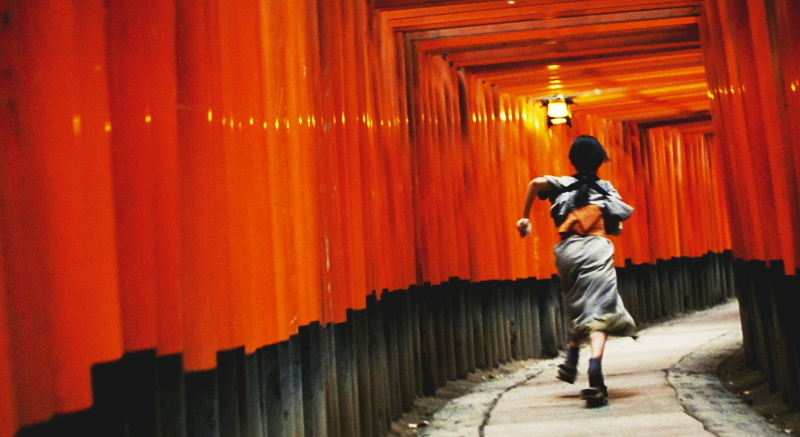 I’ve heard that other movies have also been filmed at Fushimi Inari, but Memoirs of a Geisha is the only one I’ve actually seen. See?! We were totally here. The gates at the shrine vary in size, from the most common medium sized ones in the pictures above to ones that are almost double in size and ones that are only about a foot tall. 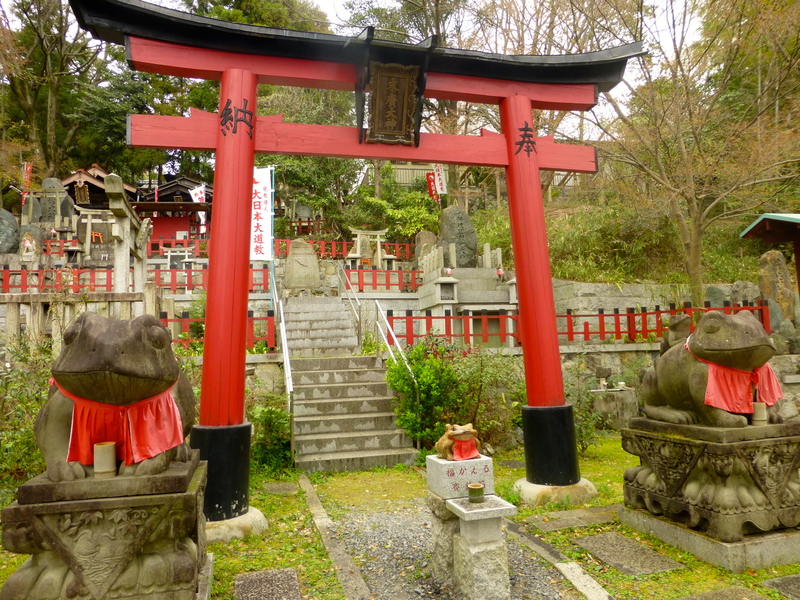 From what I gather, Inari is the god of business (and also rice), and each of the gates at the shrine was donated by local businesses. Here are the bigger gates going up the mountain toward the main shrine. Fox statues like this one are all over Fushimi Inari. 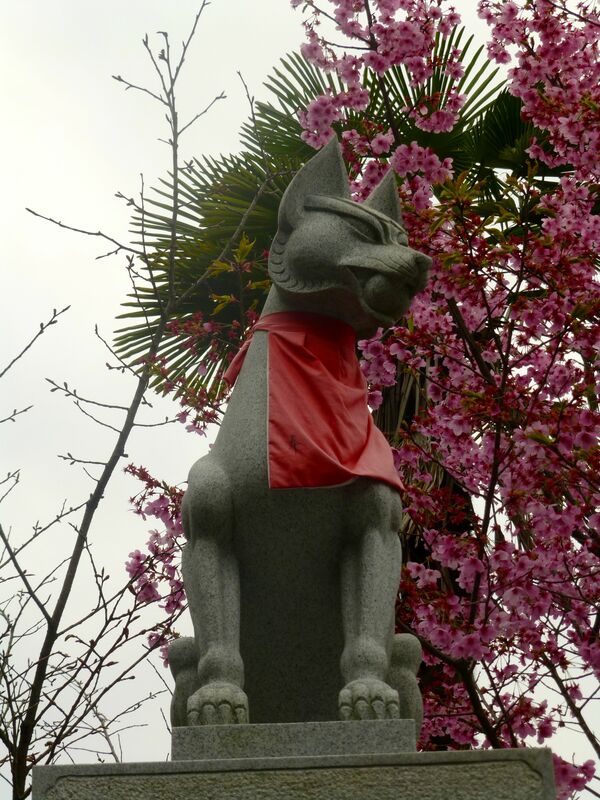 You’ll find fox statues at Inari shrines all over Japan because they are regarded as messengers of the god Inari. My favorite thing about this shrine was that there are multiple paths you can take and each one has lots of places to explore off of the path itself. 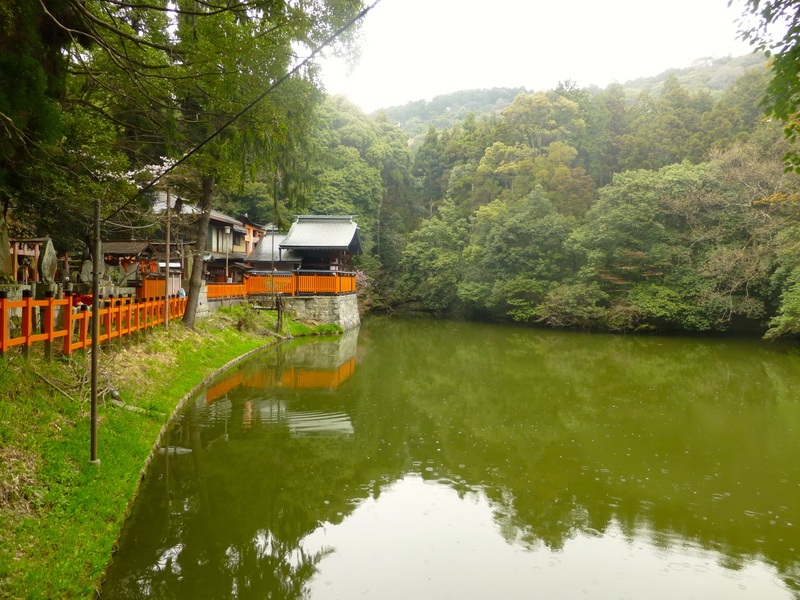 We stumbled on this little pond near some small shrines along with path. It was really nice and quiet here. Found these frog statues too. No clue what the deal is with these, but they look pretty neat! 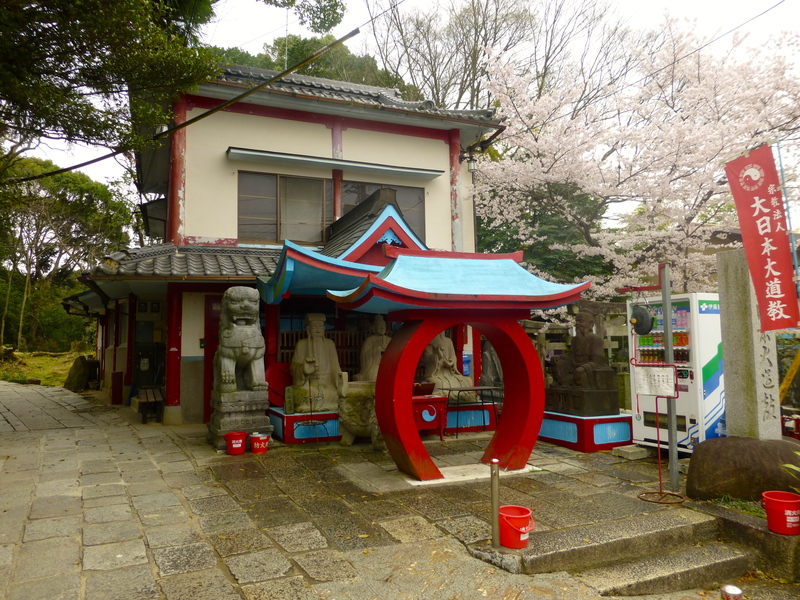 I was a bit surprised by this bright blue and red structure, and it was kind of different from other things I’d seen in the shrine so I took a picture of it. Also, take note of the vending machine on the right side of the photo—they are EVERYWHERE in this country. Paper cranes! Obviously I didn’t sit around all day counting them, but I would guess that each of these is a set of one thousand, because that’s like the magic number for origami cranes. People say that you’ll have a wish granted or that you’ll have good luck if you fold exactly one thousand and string them together like this. At Kiyomizu Temple there were so many people that sometimes we could hardly move, Fushimi Inari was busy enough that we could always see other people but never felt crowded by them, and at Tofukuji Temple we saw less than ten people in the hour that we were there (and that includes the staff). This quiet Buddhist temple was a welcome break from the crowds and noise. A building on the temple grounds. You can get a sense of scale from the girl sitting on the steps, but I feel like size of this building leaves more of an impression in person. The rock garden inside the temple. Notice the man sitting down is not wearing shoes—you are required to remove them before entering the temple. Taking your shoes off inside is a pretty big deal in this country. Japan is unbearably humid and consequently extremely mossy. 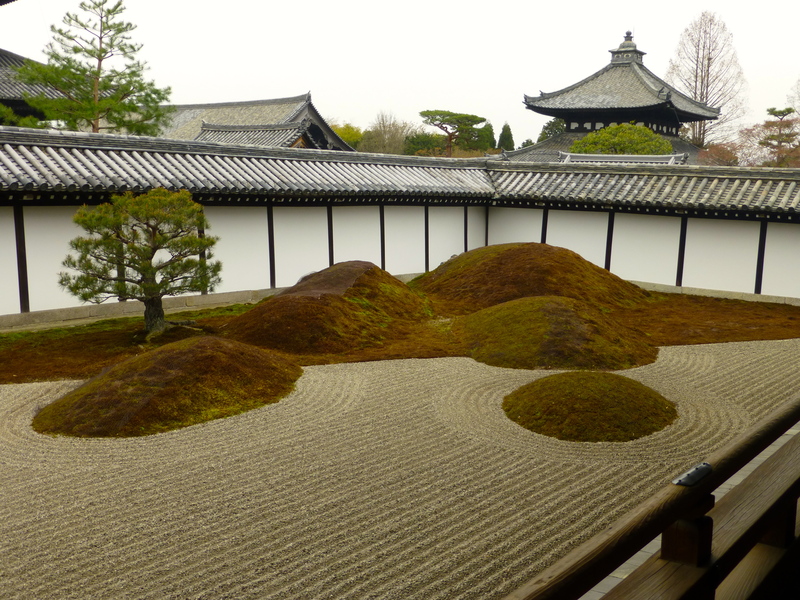 Many Japanese temples and shrines keep moss gardens like this one. 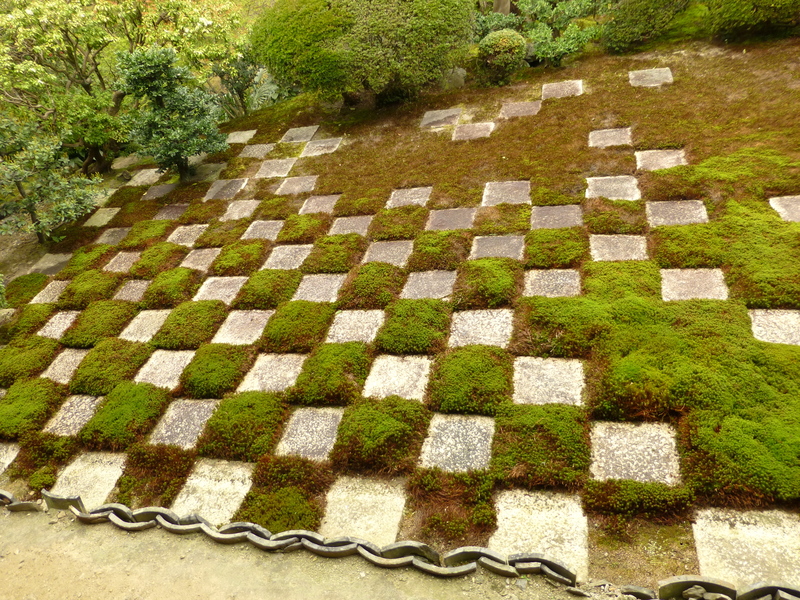 This checkerboard moss garden was the coolest thing in the temple for me. A man raking the gravel. 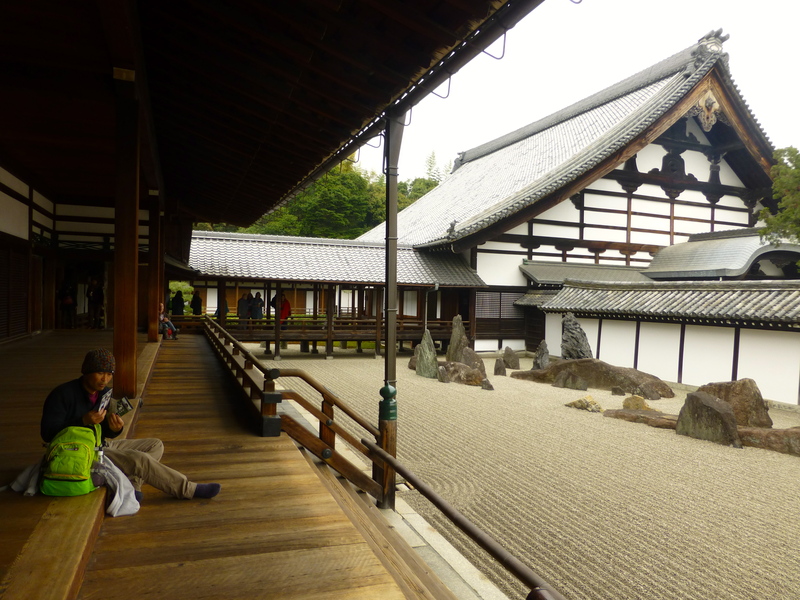 You might have noticed how perfectly the gravel is raked at this temple. 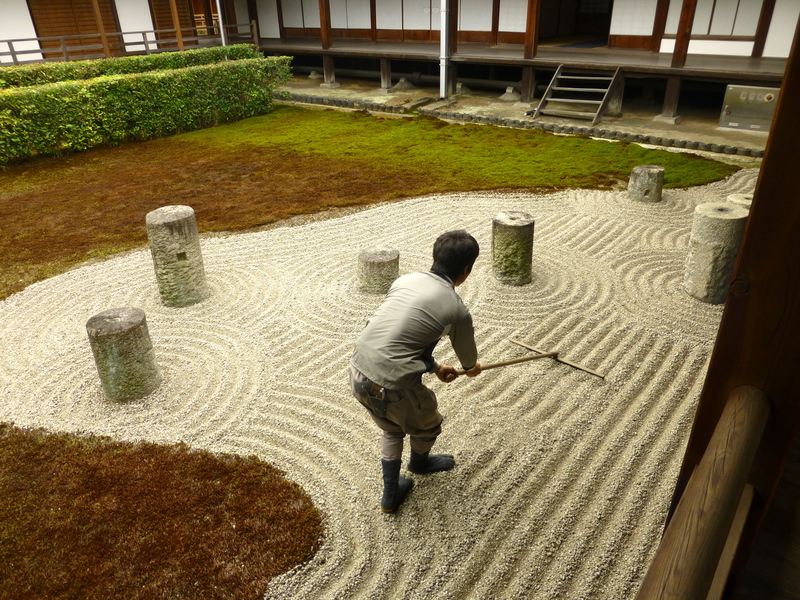 While we were there, we saw this guy here being instructed in how to properly rake the gravel. I actually felt a bit bad for him, because in the five minutes that I stood there watching his instructor did nothing but tell him how bad his technique was and made him start from the beginning like three times. This is another building on the temple grounds that I liked because it’s sort of unique. It doesn’t really even have a first floor, it just has stairs (which look like they can be raised and lowered) leading up to the second floor—stairs that I really badly wanted to climb but definitely was not allowed to. The last place I’m going to post about is Maruyama Park. 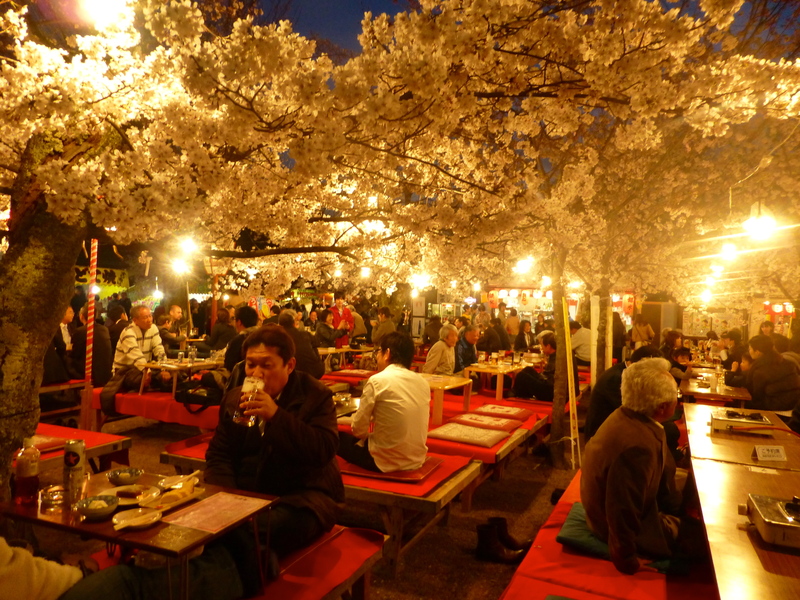 This is a big park in central Kyoto that is a popular place for meetings and picnics, especially in early April when the cherry blossoms are in bloom. 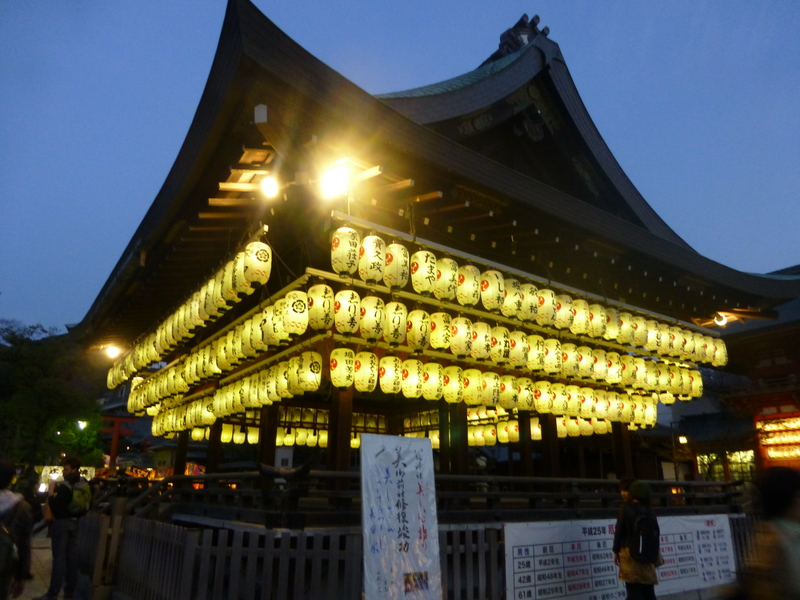 We passed Yasaka Shrine on our way there. 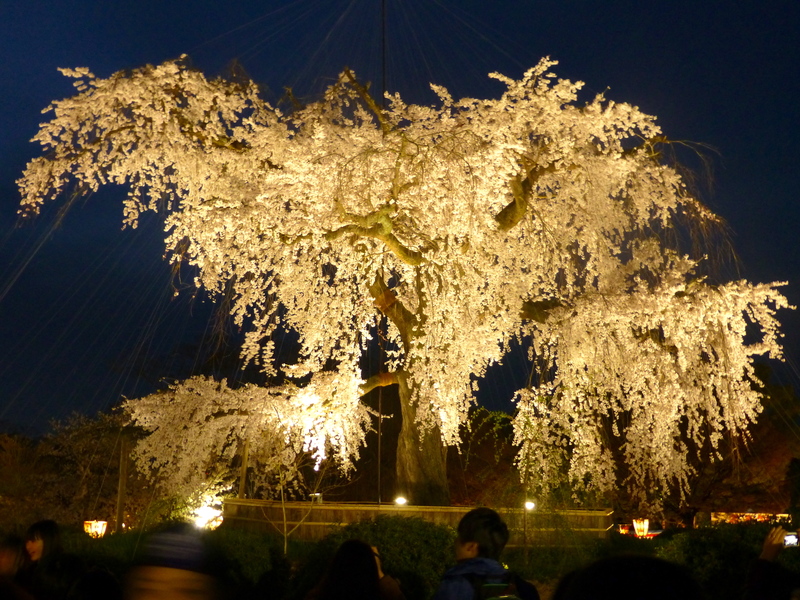 This is a huge cherry blossom tree in Maruyama Park that tons of people come to see while it’s in bloom. There must have been between 150 and 200 people standing around it and taking pictures while we were there, and when we came back to Izushi they were still talking about the tree on the evening news. This is the area of the park that people often come to to meet friends or have a picnic. 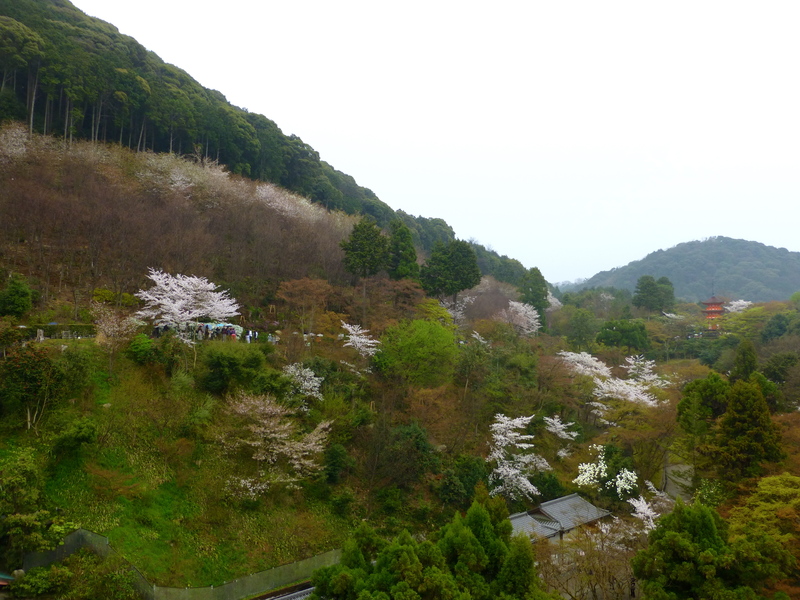 There are so many cherry blossom trees here that they almost form a canopy. We were fortunate to come on a day when there was a spring festival going on, and this is where we tried Japanese sweet potato sticks for the first time (they are delightful). And that’s all for our spring vacation. It was a really nice trip, and once we were in Kyoto I was so happy that we booked the trip during cherry blossom season. But considering that it’s already July, I think I need to move on from this and talk about some other things! 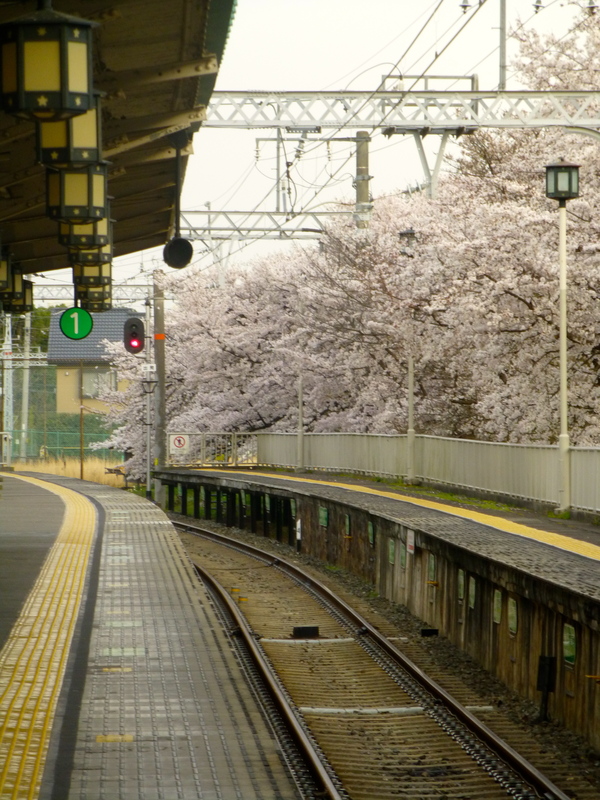 I’ll end this post about Kyoto with this picture that I took while waiting for a train.